The gas chambers of the Sobibor death camp in Poland, destroyed by the Nazis after the 1943 prisoner uprising, have been unearthed by an archaeological expedition. 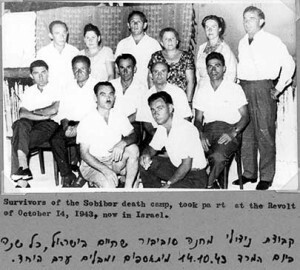 Survivors of the October 14, 1943 uprising at Sobibór in Israel after the war. The Claims Conference is proud to support documentation of this momentous project. A grant to the Sobibor Documentation Project of the Maurice Greenberg Center for Judaic Studies at the University of Hartford is enabling filming of the excavation, to be used in a future one-hour documentary, “Sobibor’s Hidden Holocaust.” The Greenberg Center, with Claims Conference support, has the only video footage of the discovery of the gas chambers, which its experts believe could be one of the most significant finds ever made at a Holocaust site. Sobibor operated as an extermination center between April 1942 and October 1943, when a group of prisoners led a carefully planned revolt and mass escape, including killing a number of German, Polish and Ukrainian guards. Of the 600 prisoners in the camp at the time, 200 ultimately escaped without being re-captured; 53 of them survived the war. The remaining prisoners were shot and the camp received no more transports following the uprising. Yad Vashem estimates that 250,000 Jews were gassed at Sobibor. The Claims Conference is also proud to support research for a biography of one of the leaders of the uprising, Sascha Pecherski, a Soviet Jewish POW. A grant to the Dutch-based Sobibor Foundation is enabling the first-ever biography to be written of this brave man who helped bring about the end of the camp. One-third of all Dutch Holocaust victims were killed at Sobibor, making the camp of intense interest in the Netherlands. 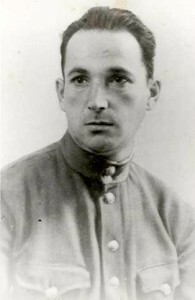 Sasha Pecherski, a leader of the Sobibor uprising, in an undated photo around World War II. The Claims Conference is funding research for a biography of him, which will be the first ever written. The excavation also discovered the water well used by the prisoners. The well contained numerous personal items belonging to Jews; while destroying the camp, the Germans filled the well with waste. The excavations at Sobibor are a joint project of Yad Vashem, the German-Polish Foundation and the Majdanek State Museum. They have been conducted by Israeli archaeologist Yoram Haimi and his Polish associate Wojciech Mazurek since 2007, who were joined in 2013 by Dutch archeologist Dr. Ivar Schute. Over the years, thousands of small personal items of victims have been found at the site. No doubt, the information that will emerge from this excavation will be of great interest to Shoah historians and the public alike. This discovery is just one more reminder that, nearly 70 years after the end of WWII, we have so much yet to learn about the extent of Nazism’s catastrophic reach.